Two experts in Internet research ethics find "that IRBs generally do not know what . . . protections apply strictly to online research, and such boards often ignore the complexities of such research and thereby risk harming subjects while also violating federal regulations, or, they apply such restrictive models that inhibit researchers from pursuing important online endeavors." Few boards were aware of extant guidelines such as the Association of Internet Researchers Ethical Decision Making document, and 74% did not provide specific training around Internet research issues, and that less than half (42%) felt the Office [for] Human Research Protections or other regulatory documents were useful in Internet research reviews. These data suggest that ethics boards may not be fully informed when reviewing such research. 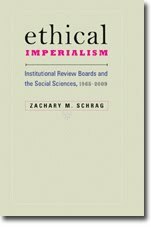 We must consider on what bases are review boards making decisions around [Internet research ethics]? Of particular concern, our qualitative data provided indications that many boards were "unsure of who to ask," "we don't even know what questions to ask of the researcher," and, "we rely on the IT department to advise us on such IT related issues." This is typical of an IRB system that rewards members and, especially, staffers who can recite the Common Rule from memory but imposes no real incentive to read the ethics literature of the disciplines over which they claim power. and In Search of Expertise.